Clementines, which are a variety of mandarin, have firm, neat segments that make them a good choice for poaching. 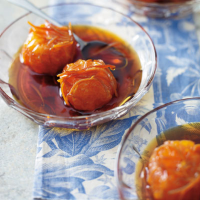 Watch this delicious winter dessert being made at Waitrose TV. 1. Cut the peel and pith from the Clementines with a small sharp knife. Strip away the pith and shred the peel from about half of them. 2. Place the sugar in a medium/large pan with 100ml water and heat gently, stirring until the sugar has dissolved. Bring to the boil, then simmer hard over a medium heat for about 8–10 minutes, without stirring, until the syrup has turned to a deep amber-coloured caramel. Remove from the heat and dip the base of the pan briefly in cold water to prevent further cooking. 3. Stir in 100ml cold water, the brandy and shredded peel and simmer gently for 30 minutes until the peel is tender. Add the Clementines, 6 at a time, and cook for 2 minutes then transfer to a serving bowl. 4. Pour over the hot syrup and peel, add the vanilla pod and leave to cool. Chill overnight before serving in small glass bowls. Try this with 6 whole oranges in place of the Clementines and serve in thick slices. Serve this dish with Waitrose Amontillado Medium Dry Sherry. See the selection of spirits and liquers Waitrose has to offer. (opens in a new window).